The number 22 was in the number kingdom doing what he had always done singing his favorite song. Suddenly infinity, the king of the numbers, appeared! 22: Your majesty to what do I owe this honor? ¥: I have some bad news. 22: I am a number and beyond good and evil and therefore good and bad news. 22 chuckled to himself since he had been waiting millennia to say that line. ¥: Another number threatens to replace you as the “spiritual master in form” number. 22: That’s impossible I am the number between idea and form that allows ideas to take on form without me the material world could not exist and ideas without substance aren’t very relevant. This has been my function since the time before time! ¥: Yeah, that’s true but to some extent your fundamental being is affected by the ideas that mortals have and they are thinking of another number as taking on your role so you might be supplanted and become just another number in the infinity of numbers. Hey, we’ve been friends since the time before time and I just thought I would warn you. 22: Who is this upstart that attempts to replace me as the master builder! ¥: What do you know about the number 23? 22: Just the usual, there is some sort of 23 enigma but I am not an enigma. I am the Master Builder! ¥: Well there was this movie and it kind of suggested all events are controlled by the number 23 and since the relation between idea and event is a type of then that covers your territory. 22: One movie! Who cares. ¥: there is also a TV show called Lost that just everyone is watching and that show keeps on plugging 23. You need to get out there and let people know you are still the number one idea/form guy! Shake some hands! Kiss some babies! Beat 23 at his own game. 22: Get out there, what are you talking about I am a number and can only exist in number land as a sentient number once I enter the world of form I become just another number without personal identity and a new 22 essence takes my place. ¥: But where there is a will there is a way. As a number you can inspire someone to take on your case and get it out there. I have this one crazy blogger in mind. He’s just the sort of guy for this assignment. Well readers there you have it. The number 22 talked to me in my dreams and needs your help and frankly I need your help! 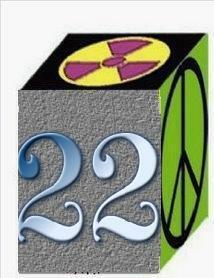 How can I convince the world that the number 22 is more important than the number 23 in numerology? Comments are most welcome!